As parents and guardians it’s our duty to guide the children of Dubai on the right path to healthy exercise and eating habits. Here's the beginning. The children of today are our future, we all have vital roles to provide guidance when it comes to the very basics of exercise and nutrition. We feed and clothe our children but are we getting it right? Leon Knight gives us a short introduction and will be adding guides on a regular basis so that you know what’s good for your children. The bad news: A study last year found that 1 in 3 children were overweight or obese and at risk of early diabetes and hypertension. Excess weight can lead to many complications including Type 2 diabetes, high blood pressure, fatty liver disease and heart disease (Yes, as scary as it sounds this is true). Learning, as loving parents and children, about healthy eating and activity habits is a crucial step in addressing these possible future and very serious health issues. In this day and age there are so many stumbling blocks. We try our best to organise some simple exercise routines and the weather changes in the height of summer – then what? We try our best to provide nutritious, well balanced healthy meals and yet there’s a McDonalds’ drive-thru every few kilometres. The sweet smelling foods are blasting out at us in every shopping mall. Yes, it’s a long hard struggle nowadays. Before the technological advancements and the low-priced, low-energy activities which take up a great deal of time on a daily basis, our children were happy to get involved in physical activity. Gone are the days when the city kids would play hop-scotch on the pavements, skipping in the school playground and all the other games with even cardboard boxes bringing screams of delight! We are not being nostalgic. We want the best for our kids. We want to see them happy, healthy and fulfilled. We haven’t even scratched the surface of the effects staring into a small screen for hours on end do to the young mind. Of course, we can point the finger of blame at advertisers, peer pressure, finances or even the schools but we need to accept that we, as parents, influence our children more than we think. If we’re slumped in front of the TV every night with a glass of wine or beer in one hand and the remote control or mobile phone in the other we are choosing a lifestyle for our children. We wake up in the morning and check our phone, we go to sleep at night but not before checking our phone. Is anything really so important? The advertising industry has proven that advertisements targeted directly to children affect their choices about foods, beverages and lifestyle. Research shows that children less than 8 years old are unable to critically comprehend televised advertising messages and are prone to accept advertiser messages as truthful, accurate and unbiased. Then again, we can’t blame their age – some 40 year olds are seemingly incapable of making a rational choice! When we consider exercise, being active uses energy and the energy obtained from eating food is balanced to help maintain a healthy body weight. Being active also keeps the heart and other muscles strong and fit which means that the body works well. If the body works well you feel good. In a child’s case stimulating the brain and body affects their mental and physical health. Unless a child craves and demands a gym membership (highly unlikely! 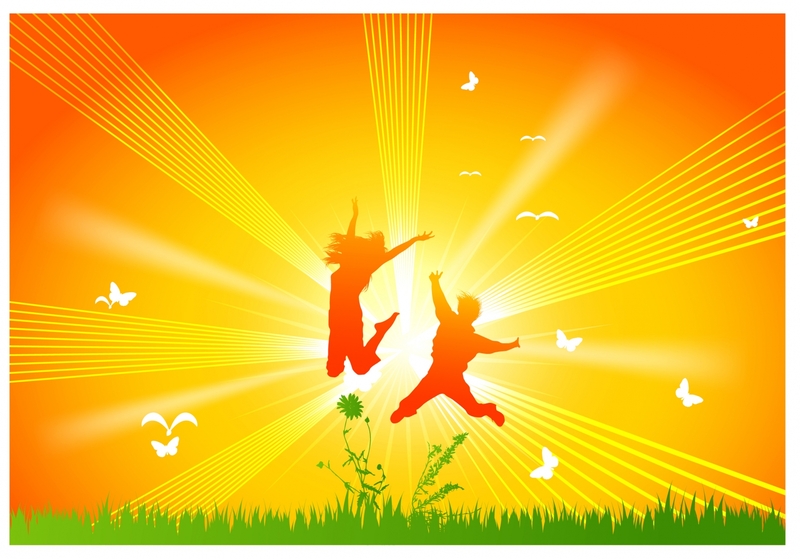 ), being active would mean doing things like going for a walk, jumping rope/skipping, roller skating, dancing or playing games like tag or hop scotch. It seems like a life-time ago for most of us, but we all used to love a good fun game in school at break time! Playing any kind of sport like football, basketball, netball, rugby or cricket are great activities and keep children enthusiastic. Dubai offers a wide range of indoor and outdoor activity play centres for children and more information is obtainable online. I recently visited Kids HQ on Umm Suqeim Road. Kids HQ is a very innovative setup which offers cognitive and entertaining activities such as ‘Les Mills Born To Move’, ‘Groovy Yoga’ and ‘Cool Science’. Definitely worth a visit. This is just one of a number of great places for children to fundamentally have fun and gain knowledge while being active. We’ll be looking at more of these centres for you. It’s so important to promote a positive approach to child nutrition focusing on healthy diet and activity habits rather than weight loss. Using a positive approach along with healthy changes that involve the whole family has been proven to improve a child’s self-esteem and is less likely to lead to negative eating issues. Parents and older siblings can act as role models by setting a good example with regards to healthy eating. Children are copycats by nature and they like to do what someone else is doing. A good example would be taking the time to eat breakfast every morning, helping your child to develop a healthy habit which will benefit them throughout their life. Another example would be portion control, to teach your child what a healthy serving size looks like. A simple way of doing this is by using your hand for reference. There are five food groups which are the fundamental building blocks for a healthy eating regime. These are vegetables, fruit, grains, dairy and protein. There are many online information portals where you can to learn about healthy eating. 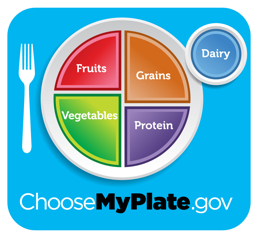 ChooseMyPlate makes life easy for us and gives good, common-sense advice about eating. ▪ Make water the drink of choice instead of soda or sweetened beverages. Try adding a slice of lemon, lime, watermelon, or a splash of 100% juice (not concentrated) if you prefer some flavour. Remember that adding sugar adds calories and hence body weight. ▪ Serve fruits as everyday desserts instead of cakes, sweets and ice cream. ▪ Read labels on packaged ingredients to find foods low in sodium. Exceeding the recommended sodium intake is known to worsen hypertension, so it is important to keep salt intake to safe levels: 1000mg for aged 1-3, 1200mg for aged 4-8, and 1500mg for aged 9+. ▪ Breakfast is the most important meal of the day. Have items available in your kitchen that can be quickly and easily prepared in the morning such as wholegrain cereals with milk, fresh fruit, yogurt or bagels. When time is short create a healthy meal box to go. ▪ Choose baked or grilled instead of fried food. Implement this at home and when eating out. ▪ Switch from refined grain to wholegrain (wholewheat bread instead of white bread). Choose products that list wholegrain ingredients like brown rice, rolled oats, oatmeal, bulgur, buckwheat, quinoa and wild rice. Get your child moving and eating well today to nourish and cultivate their future. Leon’s words of advice – Repeated small steps add up to very positive health habits. It’s official – we love Leon. Check him out!